In 1942 an Aircraft Division was formed in Higgins Industries Inc, owned by Andrew Higgins, with the object of manufacturing transport aircraft for the United States Air Force. There was also a Helicopter Division concerned with building and perfecting a helicopter designed by Enea Bossi. 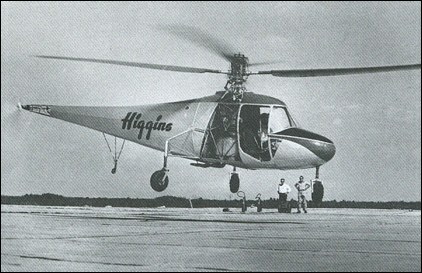 This small two-seater helicopter had a main four-bladed rotor, consisting of two two-bladed rotors a few inches apart, and a small two-bladed tail rotor. The latter was fixed to the end of the upward-rising tail so that the tail rotor hub was at approximately the same level as the main rotor. The two-place, side-by-side cabin interior was designed to resemble as closely as possible that of a lightweight aircraft with a wheel control column and a standard panel of flying instruments. The fuselage is entirely covered, has a forward section with metallic skin, while the tail is covered with fabric. There is a small, two-bladed, vertical tail rotor and a fixed tricycle landing gear. The pitch-control and clutch-control levers look much like the gearshift on a car. The rudder pedals resemble brake and clutch pedals of an automobile.